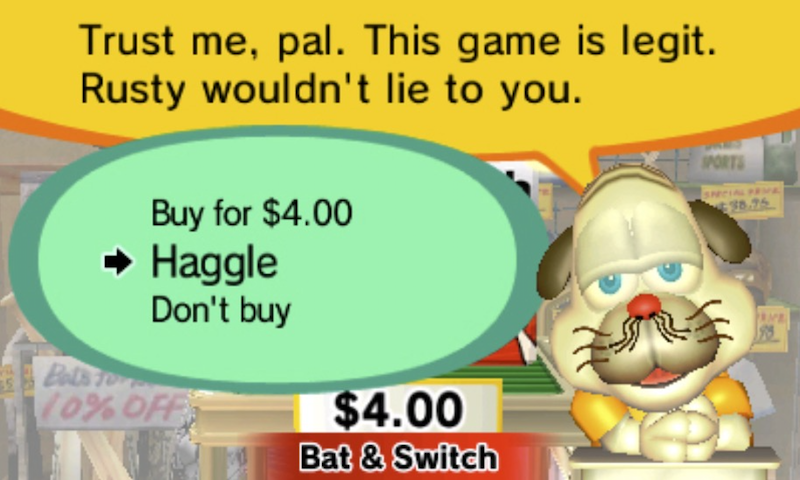 Buying games in real life is a drag, but at least Nintendo made a fun video game out of it. This is Rusty’s Real Deal Baseball for the 3DS. The problem is bigger than just GameStop, but let’s start with GameStop. On a sweltering early evening last Friday, as I finished up work, I went to a GameStop to buy an extra PlayStation 4 controller. Few gaming purchases should be as simple. Just pay for the piece of plastic and be done. Yet as is the case with buying so many video games and game-related things, even completing such a straightforward purchase was a minor puzzle. I waited my turn while the customer ahead of me worked through a transaction involving lengthy receipts. They concluded their business, and it was my turn. I walked up to the register and asked for one of the black DualShock 4s on the wall. The clerk asked me if I wanted a used one. No thanks, I said, as he made his way to where the controllers hung. I was a little distracted. A young guy at the counter next to me was trying to purchase a copy of what I think was Rainbow Six Siege. He’d brought the game’s empty display case to the store’s other clerk, who went looking for a copy. She soon told him that they were out of stock, but offered to sell him a special edition that cost 10 dollars more and included some of the game’s downloadable content. He said ok. Now he was trying to decide whether to accept the clerk’s offer to buy a warranty on the game. The warranty would protect the game against some sort of damage and also, for some reason, allow him to trade the game in any time during the next year for another game. Who knew warranties worked this way? Like me, the guy seemed confused. He declined her offer. Then he asked about it some more. It seemed strange. My clerk asked again if I wanted a used PS4 controller instead of a new one. It’d be cheaper, he pointed out. No thanks, I said again. I got my controller and split. Buying a new video game regularly makes me worried I’m potentially falling for a trick. It’s how I feel when I’m shopping for a TV and wondering what the clerk is up to as they try to upsell me a supposedly better model that has a longer list of bullet points on the box. I don’t shop much at GameStop these days, but I know it’s long been like this. For years, I couldn’t go in to buy a game without being asked about pre-ordering something or joining a rewards club. The company has long pushed used games, which they can sell and re-sell without paying wholesalers more than once. They’ve always had schemes and with each visit I make to their shops they simply seem more panicked that their time as a games retailer is winding down. GameStop has been struggling to keep up in a world dominated by online retail and digital downloads, and its shops are now filled with more and more non-gaming stuff. The GameStop where I bought my controller had a station of Pokémon knick-knacks, for example, and the in-store hype TV was showing two presenters run through scripted lines in which they gushed over a line of geek-targeted backpacks. Bookstores are struggling, too, but the people running them have not chosen to compensate in quite the way GameStop has. Over the years, the Barnes & Noble near my office in Manhattan has devoted less and less space to books, adding floor-space for music and movies and electronic readers. When I recently needed to buy my kids some books there recently, however, I didn’t need a flowchart. The clerk didn’t try to coax me into buying a gently dog-eared copy of Brown Bear, Brown Bear, What Do You See? The book industry has its problems, and Barnes & Noble is in deep trouble, but that’s not led to a situation in which buying a book regularly makes me worried I’m potentially falling for a trick. Buying a game (or controller) often does. It’s how I feel when I’m shopping for a TV and wondering what the clerk is up to as they try to upsell me a supposedly better model that has a longer list of bullet points on the box. Is this the right version of RDR2? With the content I want for the right price? Who knows! Since the first arcade machines kept running through players’ virtual lives and then coaxing them for a quarter to continue, those who sell video games have engaged in a psychological battle with their customers. Even today, players struggle to determine just what is the right price to pay for a game, a calculus that makes a movie buff’s decision of whether to see a film in theaters, rent it digitally, wait for it to hit Netflix, or just pirate it look like simple arithmetic by comparison. Should you pay for a game when it comes out? What about before, when the act of pre-ordering a game you know you want might provide additional in-game rewards? Or what about waiting for the price to drop or waiting for the game to get its first month of patches? What if the game seems to cost nothing but keeps cajoling you to play? I’ve been playing a couple of supposedly free video games lately—Pokémon Quest on my Nintendo Switch and Eden Obscura on my iPhone. With each minute that I play, I’m trying to deduce whether finally paying for extra things in the game will make the games better or whether—imagine this—it might at some point even be the morally right thing to do. These days, I most enjoy buying games digitally, because I like the hassle-free shopping and the relative lack of confusing offers. I say this, however, just a day removed from scouring the listings for the standard, special and ultimate editions of Red Dead Redemption 2 and wondering which one would be right for me. Starting this weekend, the biggest companies in console gaming will be hosting E3 showcases of their next titles. They’ll be doing something the book, music and movie people don’t do for the public. They’ll run stage shows, with people wielding microphones and hyping new games, new add-ons, new peripherals and just one more announcement like they’re selling iPhones or operating systems. Those stage shows are fun, but they always remind me about how much games are treated less like a new piece of art and more like a new car or TV model. The concept of video games as products to be sold and consumed is inescapable. It is also somewhat understandable. Most major games are more expensive than movies, books or music and so the high price necessitates a wary shopper. They are pieces of software and possess the risks of malfunction that aren’t relevant when shopping for a new book. Games are also increasingly connected, offering the studios behind them an irresistible opportunity to keep asking for more of your money. The buyer must constantly beware, even after they bought the damn thing. Makers and sellers must beware, too. Games are comically expensive to make and perpetually a potential boondoggle. Movie studios don’t spend millions creating scenes only half their audience will see. They also, for better or worse, haven’t kept the standard price for access to their marquee releases static for over a decade. It’s a drag, though. It’s a drag to love the art of games and constantly be reminded of the product. It’s a drag to want to enjoy the work without worrying that I’m buying a copy that costs too much or a copy that doesn’t have enough in it. It’s a drag that so much of gaming culture is about commerce. I don’t see it happening, but the best news that I could get out of E3 next week is some hint that somehow, some way, buying video games will no longer be a psychological test.